Animal Wildlife | Bobcat | Bobcats are widespread and adaptable predators across North America. They share the genus Lynx with the Canadian lynx, but they are a separate species with physical differences. Bobcats are usually more heavily spotted than the lynx. They have smaller feet and larger ears. They tend to have a more aggressive temperament and have been known to run the much larger lynx off of food. 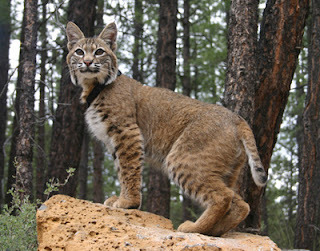 The bobcat's ears do have small tufts on the end like those of the lynx. 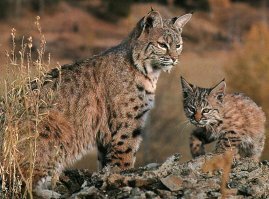 Although the bobcat shares many characteristics with the Canadian Lynx, the bobcat is smaller than the lynx at about double the size of a domestic cat. 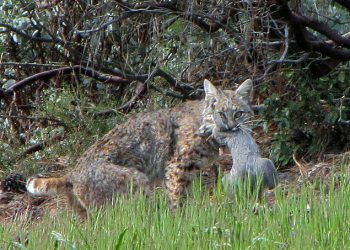 Bobcats eat mainly birds and rabbits but also eat fish and insects, that the bobcat hunts for at night. The bobcat tends stay in wooded areas and many bobcats are also found in the mountain regions of North America. Bobcats do fairly well in suburban environments and can be seen hunting at dawn and dusk. The bobcat, like many other feline species, is highly territorial and a very solitary animal, with bobcats only really coming together to breed. Some female bobcat territories do overlap however, but the bobcat individuals mark their roaming grounds using urine and distinctive claw markings on the surrounding rocks and trees. Except at mating time bobcats avoid each other to reduce the liklihood of getting injured in a fight. This would make them unable to hunt and take care of themselves. 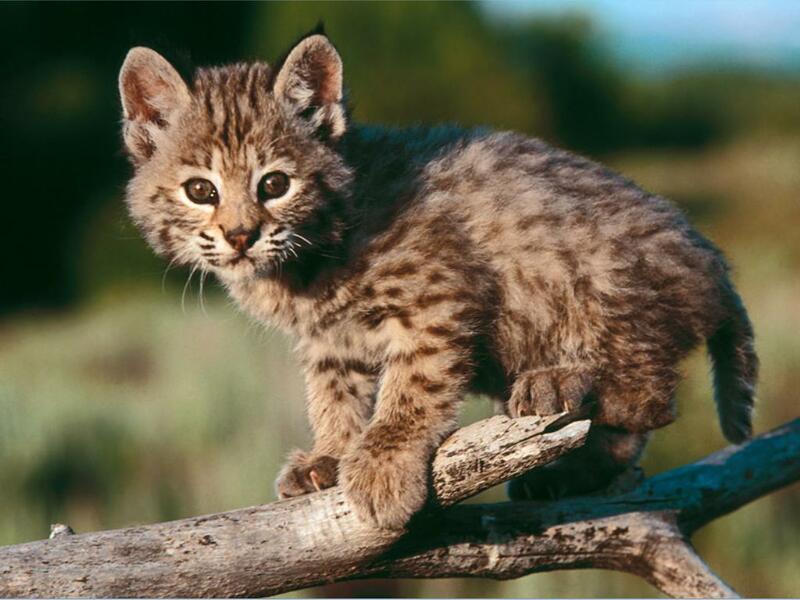 The bobcat has been hunted by humans for hundreds of years both for the fur for sport. The bobcat population however, appears to have suffered little and the bobcat has therefore shown itself to be a very resilient species of animal. 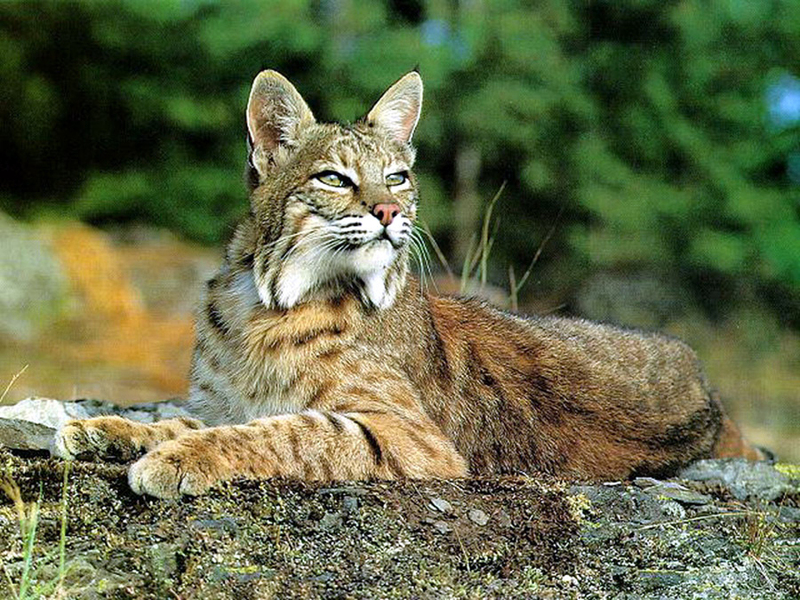 The bobcat is thought to have dominated its environment for thousands of years, with the bobcat having roots in Native American folklore and in tales of the first European settlers in the Northern USA and Canada. Bobcats are able to crossbreed with lynx in captivity. Commercial fur producers have done this in order to get the more vivid spotting pattern of the bobcat and the softer, longer, and denser fur and greater size of the lynx. 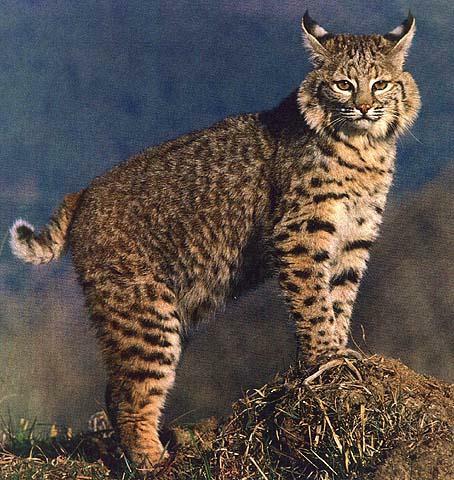 Bobcats can also hybridize with domestic cats if raised with them. Otherwise they would consider them prey.